Rely on AQHI Inc. for safe and thorough asbestos ceiling removal in Northridge CA. Textured acoustic ceilings can look pretty ugly, but that’s not all that’s wrong with them. They can also be deadly because they contain asbestos. Asbestos was a common ingredient in acoustic ceilings for many years due to its fire-retardant properties. As the ceiling ages, tiny asbestos fibers may break loose, lodge in your lungs, and cause lung cancer or mesothelioma. Fortunately, there is something you can do right now to eliminate this danger: Get professional asbestos ceiling removal in Northridge CA from AQHI Inc. Even just the idea that your ceiling might contain asbestos could be enough to affect the property value and cause you considerable concern. So you might be very eager to get any questionable materials removed ASAP. 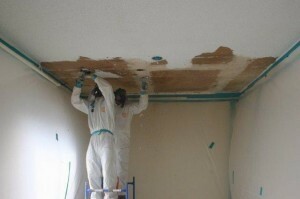 But before you commit to professional asbestos ceiling removal in Northridge CA, make sure you have considered the following points that will affect when and how you get you ceiling texture removed. Asbestos content: First of all, you need to check that your ceiling really does contain asbestos. Depending on the results of your asbestos test, you may not actually to need get asbestos removal in Northridge CA in order to keep your property safe. Present condition of the material: Asbestos-containing materials are not dangerous unless fibers can escape from the matrix. Damaged ceilings should be removed immediately, but if your ceiling is in good condition you may not actually need to remove it right now. Whenever you tackle a project involving asbestos, you need a certified contractor. This is especially true when asbestos ceiling removal in Northridge CA is involved. Normally, asbestos-containing materials are wetted down before removal work begins to help minimize fiber release. This is not possible with ceiling materials that have been painted. Asbestos ceiling materials also generate more airborne dust simply because of their location. AQHI Inc. is a true expert in safe asbestos removal, and we have the certifications to prove it. You can rely on our thoroughly trained employees to get your asbestos ceiling removal in Northridge CA done to a high standard in compliance with all relevant rules and regulations. AQHI Inc. is here to help. We pledge never to cut corners in the asbestos removal process but instead provide superior work and leave your property hazard-free. Contact us now at 800-481-8080 to learn more about our services and/or get a quote on asbestos ceiling removal in Northridge CA. Our asbestos removal office for Asbestos Ceiling Removal in Northridge CA is open Monday through Friday between 8:00 AM and 5:00 PM and closed for lunch from noon to 1:00 PM. With advance notice, projects can be scheduled for weekends, early mornings and evenings.